Marine Le Pen jumped to a huge lead Sunday over elitist Emmanuel Macron in the betting markets. Le Pen holds a higher number of bets that Donald Trump or Brexit did last year. 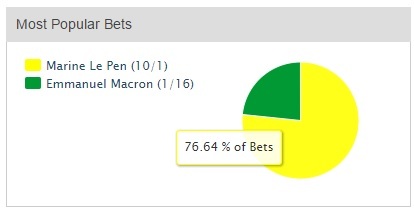 Currently Oddschecker has Marine Le Pen leading Macron 76.64% to 23.36% . 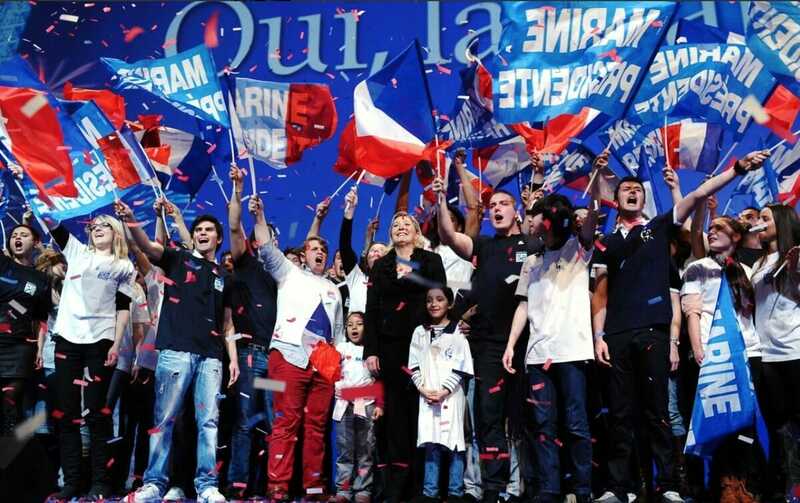 Independent candidate Emmanuel Macron is seen as the favourite to secure victory in the French Election, yet more more people have put stakes backing his opponent, found Oddschecker, which measures a number of betting odds to create an average. Overall, there are a higher number of bets on Ms Le Pen coming out on top, than Brexit or Donald Trump – even though the odds are much lower, according to the betting experts. Around 56 per cent of stakes placed have been for the anti-euro candidate to win. Sam Eaton, spokesperson at Oddschecker, said: “Trump himself has been one of two major political betting shocks in the last couple of years, the other being Brexit. Overall, polls point to Mr Macron as the next leader of France.